If you were to ask someone what the definition of an east midlands derby is, they would show you a replay of the game that took place at Welford Road on Saturday afternoon. 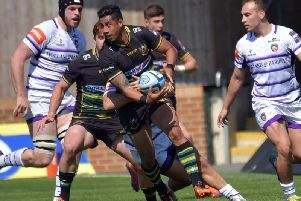 Saints and Leicester Tigers served up another encounter packed full of courage, controversy and stomach-churning excitement. It was yet another 80-minute rollercoaster ride in a fixture that is unparallelled in the Aviva Premiership and, probably, Europe. Both sides showed immense pride in the shirt they were wearing. Neither gave up and there was no shortage of quality, too. For Saints, it was yet more heartache at the home of their most familiar foes. They have still not won at Welford Road since February, 2007, and they will reflect on a costly opening 25 minutes, after which they found themselves 21-0 down. No team can give that sort of lead to Leicester and hope to come out unscathed. But, somehow, Saints so nearly did. Because what they lacked during the formative stages of the game, they almost made up for during the remainder of the match. They eventually showed what it means to be a Saint. They displayed bravery against the odds, ability and downright bloody-mindedness as they battled their way back into the game. There should have been a dramatic soundtrack accompanying their comeback as they marched into Tigers territory time and time again, threating to secure a memorable scalp. As ever on derby day, decisions and fine margins were to cost them dear. Referee Wayne Barnes once again attracted the ire of those of a Northampton peruasion for disallowing a Paul Hill try. The prop, almost in slow motion, powered his way over the line, like a tortoise outrunning a pack of hares. And his turn of pace and sheer determination deserved a try. But Barnes and his TMO, Sean Davey, decided that there was a high tackle on Peter Betham in the build-up. It was a debatable decision and one that stopped Saints securing the lead for the first time in the game. There were to be other calls that went against the men in grey, with Barnes once again seeing his name hit Saints messageboards and social media sites after derby day. One poster suggested he had written another chapter in his “How I decide the outcome of a derby” book, but to put the blame totally at his door would be wrong. Saints know that they should have started better. They know that they should not have given themselves such a mountain to climb. And they know they needed to be squeaky clean at the end to secure the draw. As it was, Courtney Lawes infringed - with the lock feeling he had been tripped by a Tigers player - and Freddie Burns landed the match-winning penalty with the final kick. It was gut-wrenching for a Saints team who had put so much into their stirring response. But while they couldn’t put a share of the spoils into their kit bags at the end, they could at least look at their muddied shirts with pride. They could know they gave everything they had for their town. They could know they refused to wilt in the heat of a pressure situation. And they could know that there are plenty of positives to take forward. Once again, the youngest members of the team showed character and ability beyond their years. Hill, Mike Haywood, Teimana Harrison and Tom Collins have all yet to reach 25. But there are established internationals who would be happy to have shown the cahunas they did. There is so much promise in this Saints side. And there is so much gratification for those young men who have emerged from the Northampton Academy. They have grown up understanding what it means to play against Leicester. And on Saturday, they showed it. It is just a shame that the result didn’t provide ample reward.